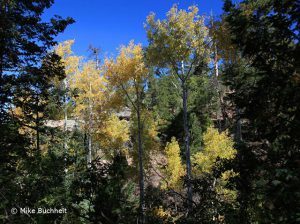 Though not on the scale of the vast deciduous forests of the Midwest and East Coast, the display of fall colors on the Colorado Plateau is no less impressive. The leaves of the gambel oak, cottonwood, and sycamore trees (just to name a few) typically change color from late September through early November. My personal favorite are the aspen, whose delicate leaves turn a shimmering gold, and stand out remarkably against the deep green of their coniferous neighbors such as the firs and pines. There is thought to be but one grove of these high-altitude beauties along the South Rim of the Grand Canyon. The dozen or so trees are located in a cool, moist ravine east of Grandview Point—one of the highest spots on the entire South Rim. After several gallant attempts to find the stand, I successfully stumbled upon them recently—their fluttering gold leaves guiding me in from an adjacent cliff. With the sedentary months of winter just around the corner, this was the perfect way to end another year of hiking, backpacking, and river running in my favorite place on Earth.